Welcome to The Choice Umbrella’s first Free Download Friday of the 2015 Holiday Season! For the next 6 weeks, I will be providing a Free Printable and Holiday DIY project on Fridays. This week’s download is a label to be used for homemade vanilla, which is a great gift option during the holidays! There are labels to print on card stock, as well as an Avery template to use in case you have Avery printables available. I have had a hard time aligning my circular prints these days with the circular stickers, so right now I am just going with card stock. Personal use only, please. 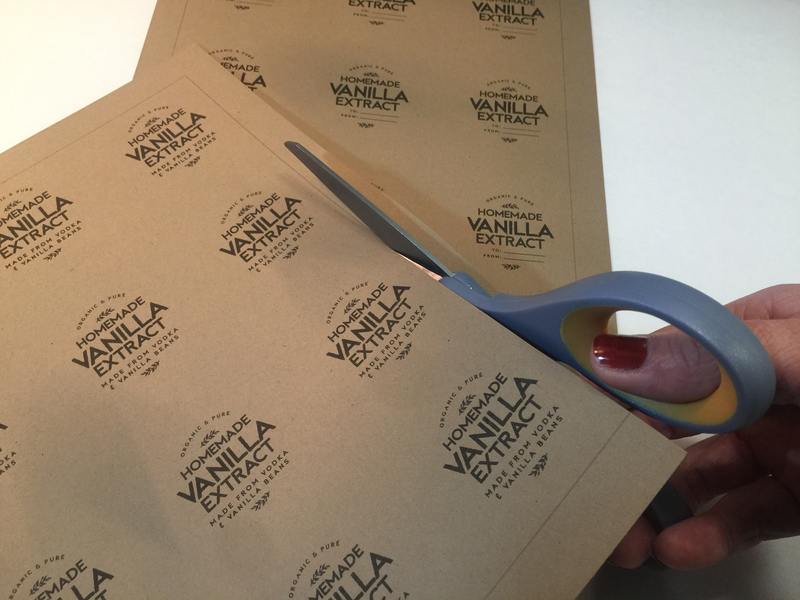 Your Vanilla labels will be emailed to your inbox! If you haven’t seen the tutorial/recipe for the homemade vanilla, you can view it here. For the circular labels, print out the file onto your card stock of choice. I use a kraft-colored card stock. There is a light grey border on these so that you can use the circular cutter and reach the printed area. Cut along the border with scissors to decrease the amount of border. Now that you’ve cut the outer edge of the paper, you’ll be able to reach the printed area with the circle cutter. Center the label in the circle cutter and press the handles together – and the label will pop out! I printed “Made On” label on kraft-colored card stock as well – but it could also be printed on an adhesive paper of your choice. There are light grey boxes that outline the labels for you to easily see an outline – I used a straight edge and a blade to cut these out. I would love to hear how things worked out with your homemade vanilla and your labels! As we get closer to the gift-giving season, please post your homemade vanilla with the hashtag of #thechoiceumbrella so that we can see!